Don't Let Go of the Rope! is a collection of Walter's inspiring stories and essays. Walter is a good storyteller. His stories will make you laugh and cry -- and sometimes pray. He knows the pain of failure and the joy of being rescued by caring friends. 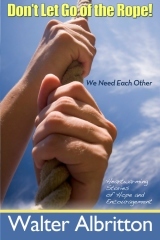 In these stories you will find inspiration, laughter, hope and encouragement. You can easily relate to Walter's stories because most of them come out of his struggles with the common issues of life. Walter hopes that you will find a story that moves you to give thanks for the people who held the rope for you when you were a "basket case," and inspire you to hold the rope for a hurting friend. 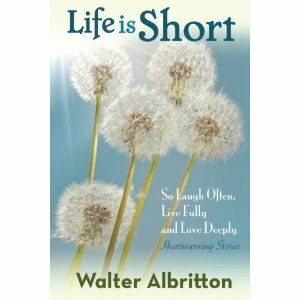 Life is Short is a collection of heartwarming stories or essays written by Walter Albritton. Walter is known as a good storyteller. His stories make people laugh and sometimes cry. He speaks and writes to offer people hope and encouragement. Ordinary people can relate to his stories because most of them come out of his experiences as a son, brother, husband, father, grandfather, great grandfather, friend and preacher. Walter loves a story that can inspire hurting people to pick up the pieces and try again. This book is a collection of some of Walter's best writing, offered with the hope that the reader will be inspired to laugh often, live fully, and love deeply since Life is Short. 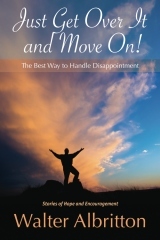 Just Get over It and Move On is a collection of Walter's inspiring stories or essays. Walter is a good storyteller. His stories will make you laugh and cry. He knows the pain of disappointment and the way to get over it and move on. His stories may inspire you to forgive yourself, pick up the pieces and try again. Do The Best You Can With What You've Got, Where You Are, While There's Time is a collection of stories that were first published in the Opelika-Auburn News in which Walter writes a weekly column called "Altar Call." His stories are printed appropriately in the "Celebrations" section of the newspaper. Helping people learn to celebrate life is one of Walter's primary motivations. You Simply Can't Trust A Talking Bird is a collection of "unsermonettes." Featured in this book are 31 columns that have appeared in the Opelika-Auburn News. It is no coincidence that they appeared in the "Living" section of the paper. These short essays contain advice on living a fruitful Christian life. Discussions include: Watching Butterflies In The Rain, One Clever Way To Prove You Are A Real Man, Free to Sit On A Pumpkin, Just Bury Me In My Old Pickup Truck, and Learning To Wrestle The Stage Fright Monster. An Exciting Saturday Night Ride In An Ambulance is a collection of stories that were first published in the Opelika-Auburn News in which Walter writes a weekly column called "Altar Call." His stories are printed appropriately in the "Celebrations" section of the newspaper. Helping people learn to celebrate life is one of Walter's primary motivations. Lord, Please Deliver Me, I Beg You, From Another Live Manger Scene is a collection of stories that were first published in the Opelika-Auburn News in which Walter writes a weekly column called "Altar Call." His stories are printed appropriately in the "Celebrations" section of the newspaper. Helping people learn to celebrate life is one of Walter's primary motivations. If You Want To Walk On Water, You've Got To Get Out Of Your Boat is a book to show you how you can gain power for your life from the story of Peter walking on the water. There's enough hidden strength in this one episode to prove once again that God's Word is just waiting to surprise you with its down-to-earth help. It's that first step that holds so many of us back. But this book will help us learn to let go of our fears and insecurities, to reach out for life at its fullest. Even if we fall, as Peter did, there'll always be Someone to reach out and help us get our balance again!